It shouldn't be like this is it ? Please explain where the error/problem is and how it should behave instead. The <html> fragment when you echoing it in PHP is highlighted using Language Injections mechanism (HTML in this case). Each language injection fragment is independent from another. 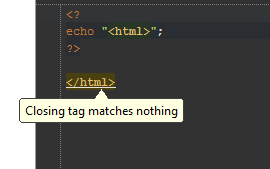 Because PHPStorm doesn't combine HTML parsed in PHP strings with plainly written HTML. I don't know how the software works but it's a mistake. So, when will dev-team fix that ?